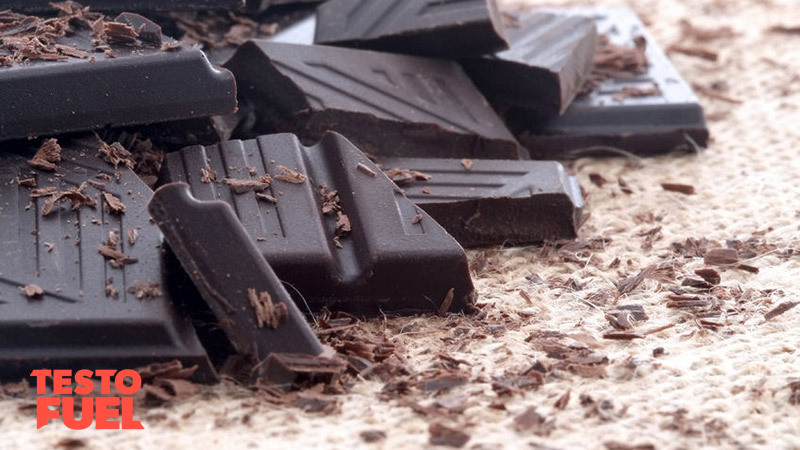 Can Dark Chocolate Boost Testosterone? No matter how strict you are with the training and diet, every now and then you’ll fancy a nice cheat treat. It helps to keep your overall diet on track, and pushes you towards your goal. Dark chocolate comes from the cocoa plant and is loaded with bioactive compounds that can help to improve your health. But can it also boost your testosterone levels? Chocolate comes from the cocoa tree – it is the dried and fermented seed of the fruit that is the combination of cocoa liquor with cocoa butter and sugar. The more cocoa liquor in the end product the darker it is – this is the paste made from ground and roasted cocoa beans that are often referred to as ‘nibs’. To be classed as ‘dark’ it has to have no less than 35% by weight of cocoa liquor . Dark chocolate is a source of fats, in particular stearic acid which is a type of saturated fat that is not thought to contribute toward impaired vascular health. Another lipid, anandamide, is a chemical messenger that acts on the brain to offer euphoric feelings – it is often referred to as the ‘bliss chemical’. This food product is also a high source of minerals. By eating dark chocolate you’ll get a hit of magnesium, copper, calcium and iron which all contribute toward decreasing the risk of high blood pressure and artery disease . Additionally you’ll also get a modest amount of fiber. As a natural, plant-based food source, cocoa has a high flavonoid content – these are the bioactive antioxidants found in plants . Although these give the food its bitter taste, they can contribute toward overall health. The main flavonoids you’ll find in this food are epicatechin, catechin and procyanidinsepicatechin. A number of studies have reported that flavonoids provide significant vascular protection due to their antioxidant properties. A study published in the American Journal of Clinical Nutrition  for example found that when healthy volunteers are given 100g of polyphenol-rich cocoa over a 15 day period, insulin resistance and blood pressure decreased – much lower than when the same amount of white chocolate was provided. Similar protective benefits have been found for the heart too. A study by Mostofsky and colleagues  reported that in a study of over 31,000 women, consuming 1-2 servings of chocolate per week was associated with lower heart failure rates. An important point made in the study was that the protective association was not observed with intake of more than 1 serving per day so benefits are not related to ‘more is better’. This food may also help you lose weight too. Researchers at the University of Copenhagen  found that when dark and milk chocolate were eaten on separate occasions, the dark variety ensured a 15% decrease in follow up meal eating in comparison. Additionally, the cocoa-rich variety made the group feel less like eating salty or fattening foods too. 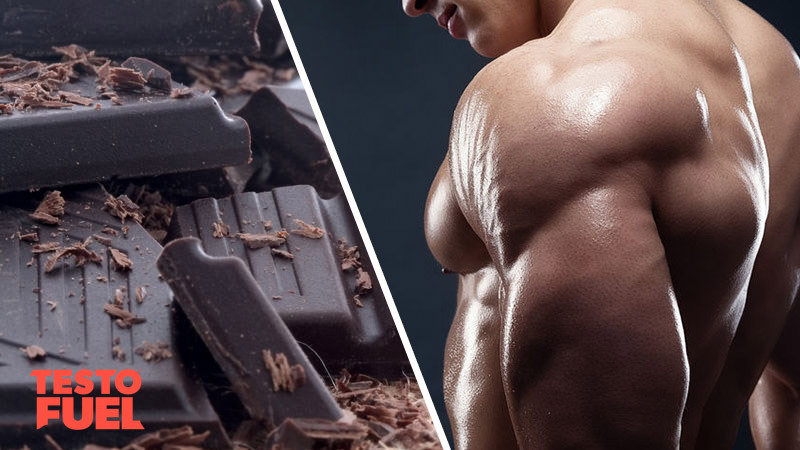 How does dark chocolate affect testosterone? The first thing to mention here is that too much refined sugar in the diet will make your T levels plummet, so it is important to go for varieties that have the lowest sugar content available – aiming for 70% or more cocoa solids will ensure a high antioxidant level whilst keeping sugar content low. Secondly, as we’ve already mentioned, cocoa is full of minerals such as magnesium, zinc and calcium and all of these are important for testosterone production. It is these inorganic substances that help to provide our male hormone-enhancing benefits. 100g of dark chocolate contains around 6.8mg of zinc. Studies such as the one published in Renal Failure  show that zinc not only boosts T levels, but also elevates luteinizing hormone – a regulator of testosterone production. Similarly, magnesium has also shown T boosting properties. A study by Cinar et al  for example showed that in high-level tae kwon do fighters, 10mg of magnesium per kg of body weight on a daily basis for 4 weeks boosted testosterone significantly. The flavonoid content of dark chocolate has been found to reduce cortisol in those with anxiety. Cortisol has a big negative effect on T levels and when it is elevated you’ll find your male hormone levels drop pretty quickly. A study from the University of Bern  in Switzerland found that when males were given 50g of 72% dark chocolate containing 125mg epicatechin, their stress hormone response was much lower when confronted with stressful events such as job interviews or arithmetic tests, in comparison to that of a control group. The authors of the study suggested that the flavonoid-rich cocoa had a direct effect on the adrenal gland to blunt stress hormone levels. Similarly, researchers in Berlin  found that administering 40g for up to 14 days reduced cortisol levels. A family of stress hormones called catecholamines also reduced significantly. Not only that, it also improved their gut bacteria levels and partially normalized their metabolism. Summary – can dark chocolate boost your T levels? Dark chocolate comes from the cocoa plant. It is the dried and fermented seed of the fruit that is made from the combination of cocoa liquor with cocoa butter and sugar. Cocoa is high in flavonoid content – these are bioactive antioxidants found in plants and are responsible for its bitter taste of. The main flavonoids you’ll find in cocoa are epicatechin, catechin and procyanidinsepicatechin. The higher the cocoa solids of the food, the higher the flavonoid content. Aiming for 70% or higher solids will limit the amount of added sugar and ensure that you’ve maximized the antioxidant content. This sweet treat is a good source of both zinc and magnesium, both of which have been shown to boost testosterone. Whilst it doesn’t contain enough of these nutrients to spark massive hormone increases it does contribute significantly. Cocoa has also been shown to reduce cortisol – the body’s stress hormone that can play havoc with your T levels. Even so, this is not a free licence to eat as much cocoa as you want – more is not necessarily better. This treat has a high fat content so can push you into a positive energy balance is you are not monitoring your diet carefully. So be aware and eat sparingly, or at best, on a semi-regular basis aiming for 1-2 servings per week. Testofuel is a premium grade formula that will help you pack on muscle and fire up your testosterone levels. This supplement contains only the highest quality, natural nutrients such as zinc and magnesium that have been shown to increase testosterone release in the body. More testosterone means more growth, bigger muscles, more energy, faster recovery and a host of other effects essential for bodybuilders. Grassi, D et al. Short-term administration of dark chocolate is followed by a significant increase in insulin sensitivity and a decrease in blood pressure in healthy persons. Am J Clin Nutr. 2005; 81(3): 611-4.